My gym corrected the blatant apostrophe catastrophe that I found there the other day, but now another one has cropped up. 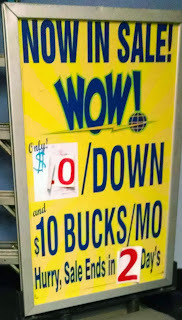 It's a little hard to see, but it says, "Sale ends in two day's." Yikes. Also, the sign should read "Now on Sale," not "in sale." And you don't need a dollar sign before "10 bucks." That's redundant. In addition to the grammar and syntax errors, this sign presents the fallacy that these sales at the gym last only a few days. Signing up for a gym membership is like buying a car (or a mattress). You never pay the sticker price, and you can negotiate. That's your public service announcement for the day.